Rustic lighting can transform your room into something more rugged, earthy and natural looking. If you are looking for rustic chandeliers to complement your dining or living room, then we have selected the best available online from Amazon for you. The chandeliers that we have reviewed will bring a more organic warmth and simplicity to your room; no pretensions, just beautiful lighting! We have covered most popular and the best rustic lighting items including rustic chandeliers, Edison chandeliers and Edison bulb chandeliers for your dining or living room in this guide. There is no best or worst in this review, but each has been given a guidance rating out of five. 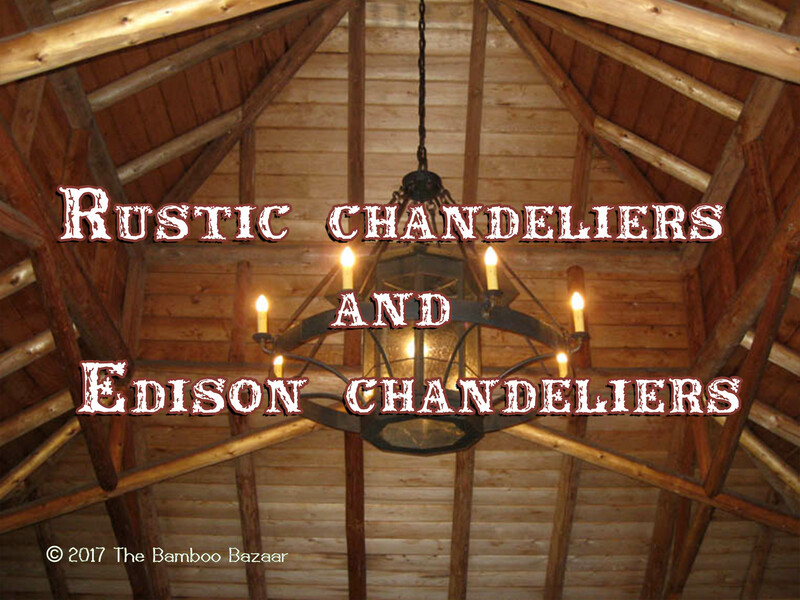 These are ten of the best rustic wood chandeliers that I reviewed for you, enjoy! Also, at the bottom of the page are some tips on how to maintain your chandelier. The first chandelier that made to our list is the rawhide wagon wheel chandelier by Cast Iron. This chandelier reminds me of the Wild West movies with the wagon wheel and it is certainly very unique. This wheel chandelier has seven downfalling amber glass shades and they hang from a 5-ft brass chain. This setting gives a very rustic and raw charm to this lamp. The combination of glass and wood combined with lamps illuminates the ceiling of any room. These chandeliers would look best in a farmhouse, a countryside cottage or a den. You can also use it in the dining area of your home to give it a raw look. It could also look good in an office with earthy settings. The wheel has been hand stained and hand rubbed to create the vintage rustic look. Self-assembly is required and installation is available at an extra cost if required. The second on our list is a raw-looking barn pipe chandelier by Seol Light. When I say barn pipe, I exactly mean that. The look of this chandelier is like a lamp picked from an old garage or unused industrial location. If you are looking for something unique and want to make a statement in your dining room or living room, then this rustic industrial pipe chandelier could be the perfect choice for you! The styling of this chandelier is very retro-looking and the copper painted piping looks amazing. The Edison style filament bulbs give it a real vintage feel. This chandelier will look great and add an extra edge to any industrial room or in a decor room. The chandelier arms can be positioned in different ways and if you choose filament style bulbs, then you will get a nice warm amber glow. Self-assembly is required, but it could take some time fully assembled. Installation is available at an extra cost if required. The color is a coppery and just what we were looking for. It warms up the fairly dark area over our table with our wood walls. Others have said there were electrical issues but everything worked perfectly on ours. We would buy it again. Next on the list is this 2-tier chandelier by Progress Lighting. This classic chandelier comes with 6 lights and bell-shaped shades that would add earthiness to any room. The cream color combined with metal work comes in two finishes; brushed nickel and forged bronze. This chandelier will look good over your classic-finished dining table, or in a bedroom with a rustic setting. It would also go well in a foyer or entry, or in a real estate office too. You will need to assemble this chandelier yourself or installation is available at an extra cost if required. The fourth chandelier on our list is a vintage 5-light lamp by Globe Electric. It’s a long lamp and looks amazing in the entry or foyer.If you are looking for that rustic industrial look in a chandelier, this will be ideal and it will certainly be a focal point in a dining or living room. I love the retro look of Edison chandeliers and this is no exception! The light has five glass pendant shades with Edison style filament bulbs and the metal work is finished in an oil rubbed bronze color. The light is customizable, with three different hanging lengths and fully dimmable. Self-assembly is required and the chandelier should be up and run within an hour. You can always use regular light bulbs, but you will not get that retro vintage ambient amber like the Edison style filament bulbs. Great piece for the price! It’s not a heavy fixture and love that it is adjustable from 15″-45″. Perfect for over an island in the kitchen. Perfect for my kitchen remodel. Only downside is it shows dust easily but that’s to be expected with a black fixture and glass. Would recommend to anyone looking for an inexpensive yet nice-looking fixture for an island. Fifth on our list is a rustic chandelier with 14 lights by Arteolamp. I love the combination of materials used in this chandelier; rope, metal & Edison filament bulbs that make it a distinctive looking light fixture. There are fourteen lights on a 40-inch wide rectangular chandelier base, the metal work is in a corroded iron color finish. The look is completed with rope jute which the chandelier hangs on and a rustic iron look chain. Just hang it in any room and give your home the needed vintage look. Most of our customers prefer it in a dedicated dining area. But you can always use it in a living room, bedroom, country home or farmhouse. The overall design is industrial with classical chandelier elements, it certainly has a uniqueness about it! Self-assembly is required and instructions are included in the setup. This light is beautiful and very cool! We have received many compliments! The next chandelier that made to the list is the appealing 8-light lamp by Franklin Iron Works. It is finished in Sperry bronze with 8 glass shades that beautify the whole look of this chandelier. Loved by our customers, this piece of rustic lamp finds its place mostly in a dining room and the entryway to add a vintage vibe. It will also look great in the hallway, in a cottage or your holiday home. The 8 lights used are 60-watt watt bulbs that are not included. They come in creamy yellow color, perfectly blending with the bronze rustic frame. To give any room an ideal grand look, LED or CFL bulbs are recommended. Or one can always use the dimmable bulbs (sold separately by Franklin Iron Works) for preferred lighting. Self-assembly is required and does not take more than an hour as confirmed by our customers. And if setting up in an issue, one can always opt for expert installation that is available at an extra cost. Terrific product, and it looks as good at our home as we fully expected. And the customer service people were very helpful answering any installation questions. This is beautiful in our dining room! Puts out good light as well. Bulbs are a little difficult to change out, but overall, this is a very striking piece worth the money. The seventh chandelier on our list is this cage-bulbed lamp by Electro BP. This is a unique looking lamp that has 5 black metal lights with Edison filament bulbs that are included with the kit. This stripped-down piece would look excellent hanging from the ceiling, giving any room a modern yet retro look. The styling of this lamp will make it look alluring in any modern house, retro house, rustic setting or a cottage. Each metal cage is styled differently and the Edison bulbs give a nice warm amber glow. Five Edison bulbs are included in the purchase price. The only downside is the instructions which are a little vague according to our customers but installation is available at an extra cost if required. The confusion here is that the bulbs are identical but the cages are not. The bulbs can be put in any shaped cage and that is where most customers get confused. Gorgeous. requires patience and someone with the mechanical skill to install, but always impresses people when they first see it. Glad I bought it. I was really worried that I was being too bold ordering this light for my conservative taste. I am SO HAPPY with this purchase. It is definitely the immediate twist to the room. We installed it over an oak island with a black granite top. Eighth on our list is this black 8-light chandelier by Liftad. It is an antique looking chandelier that comes in a globe shape and finished in metal. This chandelier has candle-like lamps, that will give any room a classic yet industrial look. This is an indoor lighting chandelier and can be placed in the foyer, dining room, living room or bedroom. People wanting to use it in offices can use it to accentuate the look of conference rooms or meeting rooms. These candles are Edison Filament lamps and the chandeliers are finished with a thick metal chain that can be adjusted for different lengths to fit your needs. This chandelier needs installation. It is easy to put together as it’s hardwired and none of our customers have complained about the installation process being lengthy or tiring. Installation can also be ordered at extra cost. This item arrived quickly. It is about the quality that I expected. It’s sort of flimsy, but for the cost, it’s great to me. It doesn’t matter once it is hung. I really love this light. I would buy it again. I bought 40w bulbs and I think it is too bright, when I get a chance I will replace with 25w. Just what I was looking for. Came much later than expected but once assembled it was worth the wait. Our ninth item on the list is this simple and rustic looking chandelier by West Ninth Vintage. This chandelier comes with metal cages that hold the four Edison filament bulbs fixed on a rustic wood plank. This Made-in-USA chandelier is perfect for a kitchen, dining room and the entryway. You can use it as a centerpiece on a pool table, in a farmhouse bedroom, in a countryside cottage. The chandelier features four porcelain sockets, four black metal cages and a hardwired electrical box suitable for all countries. The light is dimmable. The woodblock beam comes in a distressed brown color. This lamp also comes without metal cages if you prefer that way. Very little self-assembly is needed to set this chandelier up and installation is also available at an extra cost if required. Such a beautiful light! Installed easily, even without directions. Self explanatory assembly. The wood is solid and has a beautiful, aged, reclaimed look. The cages are lightweight and easily screwed on. I installed the Edison vintage style bulbs to complete the look. I love this light.. it fits my decor in my dining room.. it is very unique and it looked just like the picture.. it was very easy to install. The last that made on our list is the beautiful 4-lights lamp by Deluxe Lamps. This chandelier features an authentic wooden cage that encases the four candelabra base E12 bulbs. The material used is a dark brown wood cage and bronzed bulb holders. This chandelier used the regular incandescent bulbs. It is hung on a 39″ chain which is adjustable. Self-assembly is required and it is the easiest job to put up this lamp. Also, installation is available at an extra cost if required. Very simple yet elegant looking chandelier that will look good in your foyer or hallway. It can also be placed in commercial places like salons, realtor offices, a barista and many more places. The chandelier looks very nice. I deducted one star because the metal bar that goes through the center is loose and therefore our chandelier is off balance once we hung it. We’ll have to come up with something to straighten it out, which is a pain! How about a rustic lamp or Edison lamp for your living room, dining room or bedroom? Read my rustic lamps and Edison lamps guide here! Regular cleaning of your rustic chandelier or Edison chandelier will keep it looking new and working correctly. These tips will help you keep your rustic lighting looking good for a long time. You should not use any abrasive materials or cleaners, products with alcohol and ammonia should not be used either. General purpose and glass cleaners should not be used as the chemicals will damage the lacquer or paint on the lamp. You can clean the glass on your rustic chandelier with a soft water dampened cloth or you can use a glass cleaner, but do not let the glass cleaner touch any of the metal. Light bulbs can become dirty and dusty, so just wipe them down with a damp cloth, but remember to turn the light off first before cleaning the bulb. For rustic chandeliers that have a wood, you can use a smooth clean cloth to which water or wood polish has been applied. Never dust using a dry, rough cloth on your rustic furniture. Do not use soap and water on the wood as it can warp.